More than 70 people refusing to leave docked ship in Misrata say they face torture and detention if they disembark. 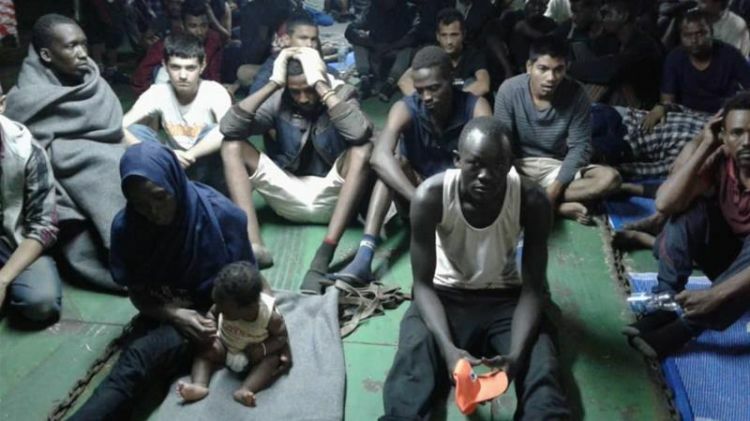 Refugees and migrants refusing to leave a cargo boat in a Libyan port are pleading to be taken to Europe, saying they are prepared to die than be returned to detention in the North African country. As the standoff with Libyan authorities in Misrata entered its ninth day, two of those on board said on Sunday it was too dangerous to go back to Libyan detention centres, where they risk being abused and sold to people smugglers while having little hope of being evacuated. "All people are saying now we don't want to go outside until we die here," Kai, an 18-year-old from South Sudan, told Al Jazeera on the phone. The refugees and migrants were brought to Misrata on November 10, four days after setting sail in a rubber boat with the hope of reaching Italy. Daniel, a 16-year-old from South Sudan, said the rubber boat had travelled almost 200km before the Panamanian-flagged cargo ship, The Nivin, crossed its path. Both Kai and Daniel said the crew on board The Nivin told them they would be taken to Italy, but instead brought them to Misrata. "We see Malta and they brought us back. All of us we entered into the international waters and they bring us back," said Kai. "Why would they bring us back; they know we die here. Why they bring us back here?" After discussions with humanitarian organisations, some of those on board the docked ship agreed to disembark, including women and an infant child. According to Doctors Without Borders, a medical charity known by its French initials, MSF, there are now 77 people on board, 28 of whom are under 18. Kai said they come from various countries, including Sudan, South Sudan, Somalia, Ethiopia, Eritrea and Bangladesh. Many are sick and injured, after being burned with oil from the rubber boat they were travelling in, he added. Paula Barrachina Esteban, spokesperson for the UN's refugee agency (UNHCR), said the world body is providing humanitarian aid to those on The Nivin. "At the moment, we're just advocating for a solution to be found and discussing with the relevant authorities," said Esteban. The refugees and migrants are being given food and water, but Kai said the biggest immediate problem is the ship's lack of toilets and bathrooms. As a result, Kai said they are forced to urinate in bottles. Both teenagers on the ship said Libyan authorities have threatened to force them out of the ship. "They tell us if you don't want to go outside, we will take you outside by force; they say we will burn the ship," said Kai. "The police are outside," added Daniel. "We are frightened." Kai said he escaped to Libya with his brother after his parents disappeared during South Sudan's war in 2013. In Libya, Kai said his brother was killed by people smugglers in Beni Walid, known as the "ghost city" by refugees and migrants, after not being able to meet their demand for a $1,000 ransom payment. Kai said this year he spent seven months in Ain Zara detention centre in Libya's capital, Tripoli, after being caught by the Libyan coastguard attempting to cross into Italy. He said there was too little food in the detention centre and he had no hopes of being evacuated or resettled. While escaping in July, he said the guards opened fire but he and several other detainees managed to get away safely. After another attempt to cross the Mediterranean in September, he said was locked in detention in Khoms, where he stayed for a month before escaping again. "Some people have [spent] nine months, one year inside the jail," said Kai. While many on board said they had survived torture by human traffickers in Libya, some also had stories about serious abuses in official detention centres. A third man on board The Nivin told Al Jazeera he had witnessed fellow detainees being shot and killed while escaping an official Libyan detention centre. Al Jazeera has previously heard reports of deaths in detention centres run by the Libyan Department for Combatting Illegal Migration (DCIM). DCIM has not responded to multiple requests for comment. In Triq al Sikka, a 28-year-old Somali man burned himself to death in October, after saying to fellow detainees he felt hopeless about his changes of evacuation. In Zintan detention centre, detainees say five people have died since mid-September, most recently a 19-year-old Eritrean. "We're very saddened about any death in a detention centre of UNHCR people of concern - reasons why we advocate for alternatives for detention to be found," said Esteban. "Sometimes, we provide on a purely humanitarian basis support to deal with the bodies of the deceased, but they're under the custody of the Libyan authorities." Julian Raickman, the head of the MSF mission in Libya, called for those on board the docked ship - and other refugees and migrants - to not be sent to detention. "People are exhausted, they don't want to go to those detention centres," she said. "I can understand as a human, and we strongly believe that we, as a humanitarian community, should work together in order to find another solution for these people than detention. "This concerns these people on the boat but also more broadly the situation of all migrants in Libya."